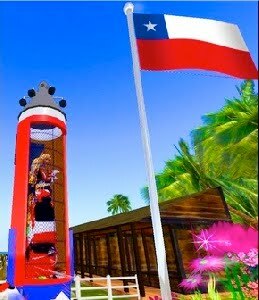 Second Life people rejoiced wildly for the safe rescue of all 33 miners in Chile! It's a miracle after 3 months underground, all miners are safe and sound. It's a victory for humankind and working people everywhere. People care! Big Time! Kleopatra Arai built a Chilean Miner's memorial site on her Cuidad Jardin (Garden City) sim, including a full scale Miner's Rescue Capsule, what the Chilean's sent down the rescue tunnel to bring each miner to the surface one by one. The Miner's Rescue capsule in SL is the creation of Juancho Faith. Kleopatra of the rescue of the 33 miners: "My experience as a Chilean in the case of the miners, from the day of the accident August 5, 2010, no one knew if they were alive or dead ... and as more days passed, lesser chance of finding them alive. At 17 days the accident was global news to find them alive, an incredible joy, but we had to wait for rescue, and no one knew how long they might be down, there was talk of months ...... On Oct. 13 we not only laughed, wept and became very excited with every rescue, also I am now intensely re-united with this great country in total solidarity!" This brought Chile together like no other event in their history! Wow! A unique case in the world and how I feel Chilean proud of it. We support the earthquake, the Tsunami, the accident of the miners, but the country came together again later. Rut Ro! Any's going for a ride! .. you can open and close the rescue capsule door, sit on a pose ball, and imagine a long long ride in a small cage. FREE T-SHIRTS! I'm sure you expected that! Yeah! You can celebrate the miner's rescue too! Come round and try these out! The shirts are in Spanish and say (roughly): We all wish well, the rescue of the 33! and on the back "Chile Miner Force". Worker Power! Way Cool! Kleopatra is also a prolific fashion designer and SL builder. She's got a huge store on the sim with every conceivable kind of ladies fashions and other SL do-dads you will need in your Second Life!